Losing someone who has touched so many is hard and shocking to those left behind. But he left us with. The world lost a brilliant, inspiring, and visionary teacher, speaker, and author yesterday, but heaven gained a new angel. Dr. Wayne Dyer made it clear that in his own beliefs, leaving this place called earth for a new destination was a "transition." His family posted in social media that: "Wayne has left his body, passing away through the night. He always said he couldn't wait for this next adventure to begin and had no fear of dying. " In his time here, he often stressed that much of of what we hold on to in our human lives -- in our minds and materially -- won't mean much on the other side. His famous quotes appear on his Facebook and Twitter feed daily. On August 27, three days before his passing, he posted a meme that read: "I have a suit in my closet with the pocket cut out. It's a reminder to me that I won't be taking anything with me. The last I wear won't need any pockets." Maybe it was randomly scheduled on Facebook by an assistant, or by maybe by Dr. Dyer. Perhaps he knew or his soul that we would all need to read it to help us look at his death through our spiritual eyes. Losing someone who has touched so many is hard and shocking to those left behind. But he left us with so many inspiring thoughts and so much wisdom. One thing many will agree on is this famous quote from Dr. Dyer: "Love is my gift to the world. I fill myself with love, and I send that love out into the world." When words came out of his mouth or showed up in his books or on his Facebook page and around the Internet, so many people were inspired to think: Yes, I want to believe this... I want to change the way I see my world... I can do this. I know I always felt that way listening to him speak or reading his words. Dr. Wayne W. Dyer gave so many people HOPE and helped them put on their spiritual thinking caps and soulful glasses so they could view their world in a new, more positive way. Here are some of my favorite Dr. Wayne Dyer inspiring quotes about following your dreams and living life to the fullest. Maybe, just maybe, they will be just what you needed to hear today. What's your favorite Wayne Dyer quote? Sources: Dr. Wayne Dyer on Facebook and Goodreads. 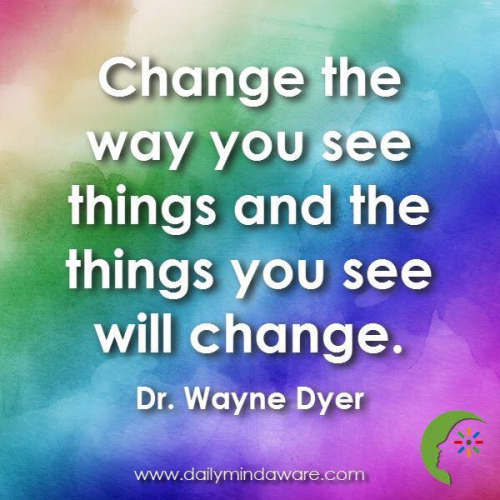 Visit Dr. Dyer's website for information and inspiration.